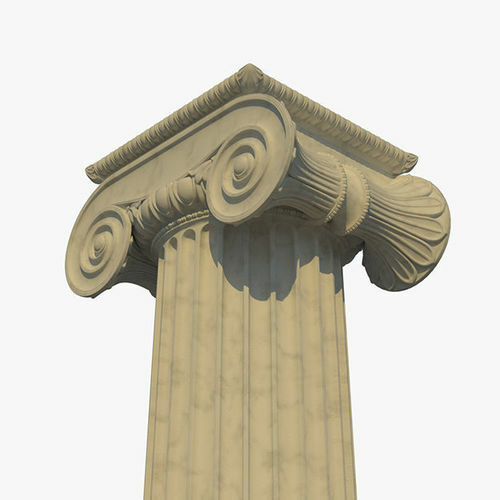 This high quality, photo-real model of an ionic column is inspired by a cap design from Athens featured in the Cyclopedia Of Architecture, Carpentry, And Building Vol 7-10 (1912). The roll or end of the volute is decorated or carved with some simple leaf ornament. This fully textured and detailed design allows for close-up renders. This is a model that will enhance detail and realism to any of your rendering projects. High-quality polygonal quad model, correctly scaled for an accurate representation of the original object. All textures and materials are included and mapped in every format*. No cleaning up necessary just drop your models into a scene and start rendering**. Model does not include any backgrounds or scenes used in preview images***. (4 .jpg) 1024 x 1024 ***************************************** Preview renders with subdivision set at subdivision level 2. Textures supplied are public domain. **Polygons exported in face mode. Subdivision will need to be applied. **Model does not include any backgrounds or scenes used in preview images. Model created in Modo 12.1v2. The blue sky previews were rendered in V-Ray 3.6 for Modo.